To whom you entrust the care of your teeth and gums is an important life decision. Proper dental hygiene at home is one huge part of protecting your oral health throughout life, but the other key component of a complete oral health plan is finding a dentist you can trust for comprehensive, compassionate, and affordable dental care. We at The Downey Dentist have been providing top quality dental and oral care to the people of Downey, California, and surrounding communities for many, many years now. And our many patients have responded by leaving overwhelmingly positive reviews on Yelp and on other online review sites. We have numerous regular clients who come back to us again and again for everything from regular check ups and teeth cleanings to cosmetic procedures like teeth whitening to major dental operations like dental implants or orthodontic braces. And we also get a large percentage of our new clients on referral from our past and current clients. What sets The Downey Dentist apart from other dental offices? In a word, it's "client-focused." We always make it our most important goal to serve you and meet your dental needs in the most efficient, effective, and convenient way possible. We put a high premium on honesty, integrity, and true professionalism in dentistry. We are a comprehensive dental care service. That means we cover all of the dental needs you and your family are likely to ever have. While there's always the possibility of our needing to recommend you to a specialist, for the most part, we can "do it all" in one convenient location and at the highest level of expertise. Our staff is filled with top-tier graduates from prestigious schools of dentistry, such as the UCLA and USC programs. And we have a long list of service areas. But we also keep ourselves affordable and offer in-house payment plans and financing through Care Credit. And we offer FREE first exams with digital X-rays to all of our new patients. The Downey Dentist provides high quality, affordable, comprehensive dental care for the whole family. We are located in Downey, CA, and serve numerous surrounding communities and patients in the L.A. Area and beyond. The American Dental Association recommends at least 2 regular dental check ups per year to maintain optimal oral health and to catch any developing problems as early as possible. Come to the The Downey Dentist, and for first time patients, the first dental exam of the year can be free of charge! During our dental exams, we will carefully examine your mouth, using our long time experience and high tech tools to spot any potential problems with your teeth or gums. We'll look for signs of tooth decay, wear, or weakening and for gum soreness or recession. We'll also take digital X-rays to make the exam even more thorough. Click "Read More" to explore our new patient special offers, including FREE dental exams with X-rays, FEE dental implant consultations, FREE orthodontic evaluations, and much more!. 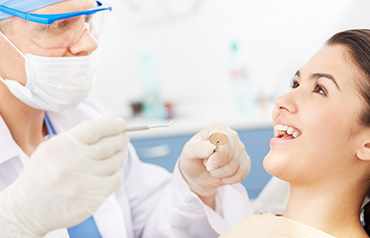 The Downey Dentist has expertise across the full spectrum of dental specialty areas. We can handle almost everything in-house, so it's rare that we would need to recommend you to a specialist dentist somewhere else. Oral Surgery - Such as extractions. Endodontics - Root canals are a prime example of endodontics. Prosthodontics - Dentures and dental Implants are common prosthodontic matters. Periodontics - This area of dentistry covers the treatment of the various stages of periodontal (gum) disease. Pediatric dentistry - Children's dental care requires special expertise and a lot of compassion and patience. We have it! Orthodontics - We can do both traditional braces and Invisalign! Most US adults have already lost one or more teeth, and our seniors typically have lost multiple teeth. But tooth loss is more than just an aesthetic problem - it can lead to teeth drifting out of place, an irregular bite pattern, and the loss of gum and bone tissue below the missing tooth. At The Downey Dentist, we are well trained and experienced in installing all manner of modern dental implants for our patients. We can give you an initial exam to determine if you're a good candidate for dental implants or if you first need to undergo bone grafts and/or soft tissue grafts to prepare the way for the implants. We can help you make an informed decision on which type of implant to choose. Single implants can replace individual teeth, but for those with all or most teeth missing on one/both jaws, implant-supported permanent dentures may be a better option. Modern dental implants consist of a titanium root that is safe to use and that will firmly bond with the underlying bone tissue so you can use the implant tooth just like a natural tooth. Dental implants are easily the best tooth restoration option available today. We can help you get started on restoring your smile! The Downey Dentist is a full-service dental office that can meet all of your dental needs on a continual basis. 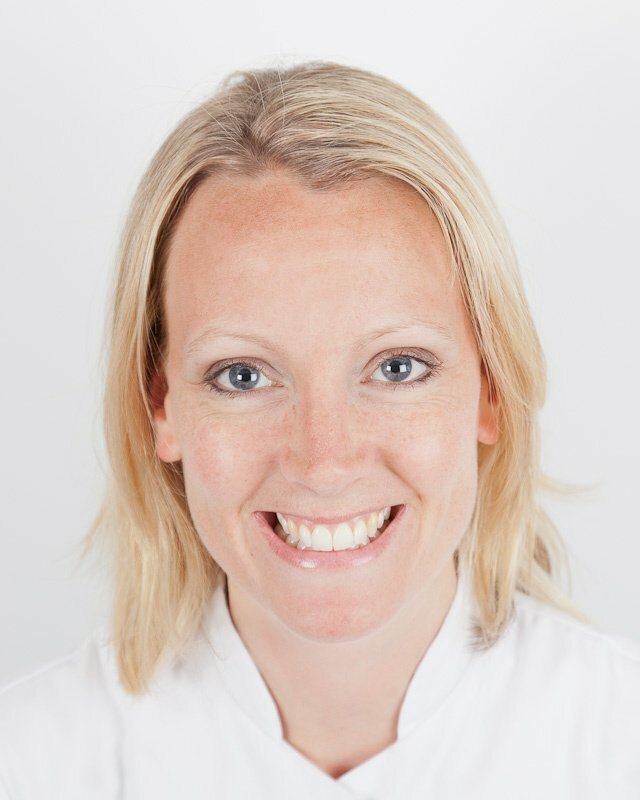 We take pride in delivering our patients top-quality care for virtually every type of dental service you can name. We have the latest dental equipment, a clean, up to date facility, and are well trained in all the most advanced dental techniques. We also offer free initial exams and X-rays to our new clients and make ourselves as affordable as possible through discount programs, financing plans, multiple payment options, and acceptance of most major dental insurance. We are conveniently located in Downey, CA, and serve the surrounding communities of East Los Angeles, Montebello, Pico Rivera, Bell Gardens, Whittier, South Whittier, La Mirada, Norwalk, Cerritos, Paramount, Compton, Willowbrook, Lynwood, South Gate, Huntington Park, Lakewood, Buena Park, and more! The Downey Dentist has two full-time, fully trained dentists on staff: Doctors David Ganji and Sam Ganji, both of whom graduated with honors from prestigious US and State of California dental schools/programs. Dr. David Ganji has a Doctor of Dental Surgery (DDS) degree from USC, while Dr. Sam Ganji holds a Doctor of Dental Medicine (DDM) degree from the prestigious University of Pennsylvania School of Dental Medicine. Both degrees are actually quite similar in terms of which types of dental procedures they enable one to perform, and both of our on-staff dentists engage in continuing education to keep up to date on the latest advances in modern dental care. Plus, our dentists have deep and wide ranging experience in caring for real patients over many years of dedicated service to local communities. Also realize that our other staff members are well trained and highly skilled at their respective roles. We have state-licensed dental assistants on staff, and we also put a high value on providing you with excellent customer service! Why does The Downey Dentist exist? Because you and others like you in and around Downey, CA, and all of Los Angeles, have a need for a local, high caliber dental service provider with a wide range of service areas. 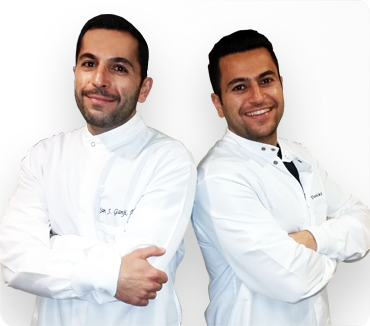 From day to day, Doctor Sam and David Ganji meet the specific dental needs of numerous patients who come to see them. Whether it be an annual or semi-annual check up, a consultation aimed at diagnosing particular dental symptoms, a tooth extraction, a root canal, dental implants, adjusting braces, or a host of other dental needs - we exist to meet them all at the highest level of expertise for each and every one of our valued clients. We will help anyone in need of dental care, both for regularly scheduled and emergency visits. But what we really mainly aim to be is your regular family dentist. 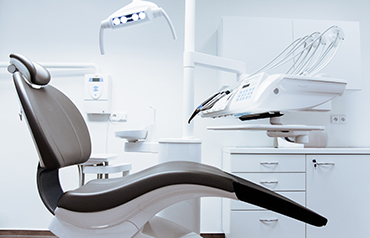 We have acquired wide-ranging skills and experience across most dental practice areas for that very reason: so you won't have to go to multiple different dentists depending on which particular dental problem you are experiencing. We make dentistry convenient, affordable, and at the same time of the highest level of quality for the whole family! Your oral health has a huge impact on your overall health. It's a proven fact. By helping you maintain healthy teeth and gums, we help you remain a "healthier you." Our services can catch dental and periodontal problems early when they can be reversed or corrected more easily and with less expense incurred. We offer both preventative and restorative dental services, along with cosmetic dentistry such as teeth whitening. Additionally, we can give you sound advice on how to improve your dental health regimen at home, on how to get the kids to do the same, and on how to care for yourself during recovery and healing from any dental surgeries or procedures we perform. In short, we help you prevent dental problems and correct them earlier when they do still occur. Our offered services at The Downey Dentist are aimed at promoting the health, function, and appearance of your teeth and gums. The high level of training and experience possessed by Dr. Sam Ganji and Dr. David Ganji, along with our state of the art dental office, give us the edge in performing almost any dental procedure you can name. Below, we'll go into a little more detail on some of our major service areas, to give you a better idea of the scope of what we do. A dental exam every 6 months is recommended practice, and at least one exam per year is strongly recommended to maintain your dental health. We give you your first exam free, and we are confident that many of our first time clients will become regular clients. Why? Because we give you a level of service that you won't get, frankly, from most other dentists. Our exams are very thorough, going step by step over every area of potential decay, wear, infection, misalignment, or other dental problems. And we do not pressure you on what to do about any problems we discover - we simply give you the facts and enable you to make an informed decision of your own. The up to date X-ray machines we use at The Downey Dentist give you instant, high resolution, digital images that you can view right in front of you on an LCD screen. Our X-rays are more detailed than those of many of our competitors, and they also produce around 90% less radiation than some other techniques. Additionally, we use intra-oral mini-camera technology to access hard to reach areas of your mouth so that they too can be put before you and your dentist on the LCD monitor. There are many types of tooth fillings we can use when you have a cavity, but typically, we use composite fillings that are "tooth colored" and will blend seamlessly into the rest of your smile. These are composite resin fillings that are very, very strong. They last longer than most other filling materials, and they resist staining better too. Finally, note that white composite resin requires less of your natural tooth material to be removed as compared to gold, silver, amalgam, and other options. The Downey Dentist qualifies as both a general dentist and, in many areas, a specialist dental office. As to general dentistry, we provide the full range of services you are likely to ordinarily need. 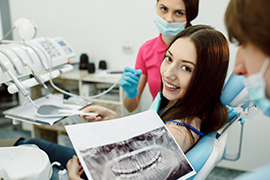 Exams, tooth cleanings, X-rays, and good advice on improving your oral health. Curing cavities and putting in white or metal fillings. We typically use enamel-colored white resin for fillings but can accommodate you if you'd like a different filling material. Root canals can be performed to save a tooth that is badly decayed on the inside. We know how to cleanse the infected tooth cavity and properly fill it with gutta percha, then crown it so your tooth is strong, fully functional, and looks great! Tooth extractions, both simple and complex (where a tooth must be split or is lodged up against another tooth). We always try to save your natural tooth first, but we are skilled at extractions when they're necessary. Crown placements. We can place a crown on your root canal tooth, on a dental implant, or on a cracked or badly chipped or worn tooth. We offer you porcelain, metal, metal-fused-to-porcelain, ceramic, and composite resin as crown material options. Bridges and dentures (fixed or removable,) are also within our sphere of expertise. We can be the regular dentist for you and your whole family. We understand the dental needs of patients of every age group, including children, and we have many families that choose us as their permanent family dentist. We work with you on scheduling, keeping ourselves as flexible as possible to cater to your busy schedule. We even do same-day appointments when necessary and possible. Also, we understand how expensive it can be to raise and care for a family. Therefore, we keep ourselves affordable via competitive pricing, accepting most dental insurance plans, accepting credit cards and most payment methods, allowing for affordable payment plans, and giving low or no interest financing to our clients. It may be ideal to plan a dental appointment months, or at least weeks, in advance - but that's not always feasible. Sometimes, dental emergencies come up quite suddenly and you can't afford to wait for days on end. We therefore provide 24/7 emergency care and allow for short notice, or immediate, dental appointments for emergencies. What exactly is a dental emergency? 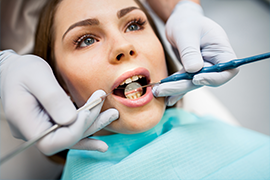 In general, a cracked or broken off tooth, an excruciatingly painful tooth ache, or a crown, bridge, or other dental appliance that's come loose would qualify. And for anything you feel to be a dental emergency, don't hesitate to call us for immediate help! Dental implants are the most advanced way of correcting tooth loss in modern dentistry. They have many advantages over dentures and bridges, although those methods of course still have their usefulness in certain situations. A dental implant is formed from an implant "root," which is a titanium metal rod that fuses safely to the jawbone as your mouth heals post-op. An abutment used to give the rod extra support, and a dental crown caps the implant rod. The end result is an artificial tooth that looks, feels, and function just like a natural tooth. You also care for the implant just like a natural tooth - no need to worry about food particles getting trapped under a dental appliance or about removing dentures and cleaning them each day. Also, dental implants won't make your gums sore or wear down your alveolar ridge like dentures can. And, unlike dentures, the regular pressure implants put on your gums/jawbone prevent them from deteriorating over time. Professional teeth whitening removes deep-seated stains from your teeth that at-home methods simply cannot compete with. At The Downey Dentist, we use Zoom Teeth Whitening, which is widely regarded by dentists as the premier tooth "bleaching" method. 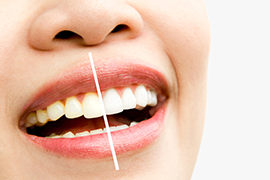 Zoom can brighten your teeth to several shades whiter. And the procedure only takes one relatively brief office visit to complete. Another cosmetic dental procedure, aside from Zoom Teeth Whitening, that we provide at The Downey Dentist is the application of dental bonds and veneers. Bonding can be used to seal small fissures, chips, and imperfections in your tooth surface. But it also can hide discolorations. We use enamel colored bonding agents that are safe, durable, and affordable. Porcelain veneers can also cover over dental discolorations. These are paper-thin coverings that bond to your tooth. Veneers are normally used to cover larger areas of a tooth (maybe the whole front) and/or to shrink inter-dental gaps. We offer a variety of different types of dental crown, including: porcelain, metal, metal-fused-to-porcelain, ceramic, zirconia, and composite resin. Crowns may be needed to cap a root canal tooth or dental implant root, or to strengthen a tooth that is cracked, chipped, worn down, or otherwise badly damaged. We can help you understand the differences among different crown materials and choose the one that's right for you. Although dental implants are usually the best option for restoring a lost tooth, dental bridge and dentures still have their place. A bridge may be a good option if only one or two teeth are missing and if the missing teeth or far back in the mouth. 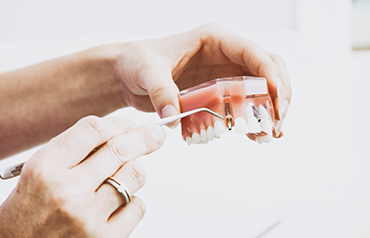 Dentures can be partial or full, removable or fixed, and may suit the situation if your mouth isn't ready for implants or if you don't want implants. Bridges and dentures have long helped overcome tooth migration, bone/gum loss, difficulty chewing or speaking, and other problems caused by tooth loss. A filling is the answer when it's just a cavity, and extraction followed by a dental implant may be the solution when a tooth is too badly damaged to save. But a root canal is best for those "in between" situations where the tooth's pulp is infected but the tooth structure itself is intact. A root canal operation will remove infected pulp, clean the tooth canal, fill in the tooth cavity with gutta percha, and then cap the tooth with a crown to keep it strong and fully functional. At The Downey Dentist, we handle orthodontics as well. We are experts in recommending, installing, and monitoring all types of traditional braces to help correct tooth misalignments. However, we also offer Invisalign, a kind of ”invisible braces" that consist of series of acrylic trays that gradually nudge teeth into their proper position. Invisalign trays are translucent, and people may not even know you're wearing them unless they see your teeth up-close. While metal braces are required for certain tooth alignment problems, many prefer Invisalign whenever they're an option. We at The Downey Dentist keep ourselves consistently available to answer your call and to give you a call back if it's after hours and you leave us a message. Contact us today by calling 562-746-0350 for further information, for answers to any dental related questions you may have, or to schedule an appointment! If you are a new patient, be sure to take advantage of our free exam and X-rays and other special deals for new clients. If you are experiencing a dental emergency, we can expedite your appointment and normally see you same-day. And if you need help with financing your dental care, talk to us about it and we can likely find a workable payment plan or financing plan for you.